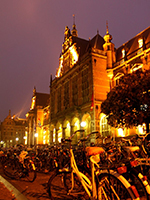 Founded in 1614, the University of Groningen (RUG) is the second oldest university in the Netherlands. The University of Groningen enjoys an international reputation as one of the leading research universities in Europe. It has a large international network and an excellent reputation for academic teaching with a modern, student-oriented approach. The RUG is a large (27,000 students, of which 15% come from abroad) university that offers a broad and complete range of education and research that includes the natural and social sciences as well as medicine, law, arts, philosophy, theology, geography, mathematics, computer science and economics (Wikipedia). At the RUG, MEME is organized by the Groningen Institute for Evolutionary Life Sciences (GELIFES), a national centre of excellence in ecological and evolutionary research. GELIFES has as its mission to pursue research that furthers the understanding of fundamental biological processes at all levels of biological organization, with particular emphasis on the integration of mechanistic and evolutionary approaches. GELIFES’ research fields cover a wide array of expertise, ranging from neurobiology, physiology, genomics and behaviour to ecology and evolution, from molecular genetics, theoretical modeling and brain analyses to organismal and species interaction studies in semi-natural conditions and in the field. Studying mechanisms within an evolutionary and ecological framework requires the use of a large diversity of model organisms ranging from microbes, algae, plants and insects to vertebrates such as fish, birds, rodents, marine mammals and humans. There are a number of close collaborations between GELIFES and other groups and institutes within the University of Groningen, including evolutionary social psychology, sociology, artificial intelligence and the university medical centre. The local MEME coordinator at the University of Groningen is Prof. Leo Beukeboom.